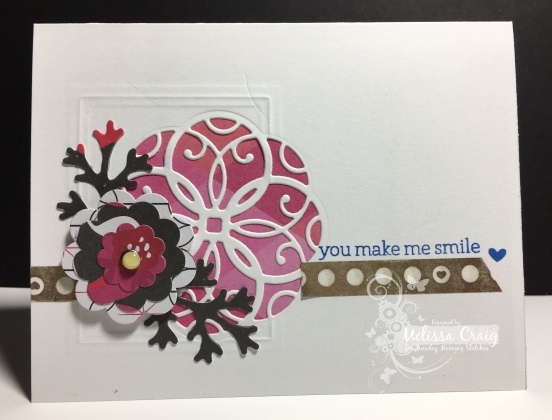 Melissa your die cut is gorgeous and that is a beautiful sentiment on your beautiful card. Happy New Year! This is beautiful!! No lack of creativity shown here! I'm going to have to remember your great idea to emboss the rectangle element. This is so pretty with the combination of embossing and die-cutting. Love the pink color and pretty cluster of flowers and stems. Great take on this fun sketch! Well your time certainly paid off Melissa because this is a gorgeous card!! I love the colors and the embossing & die cutting so classy! WoW! Love the effect of that new die! Might have taken awhile but it was worth it!